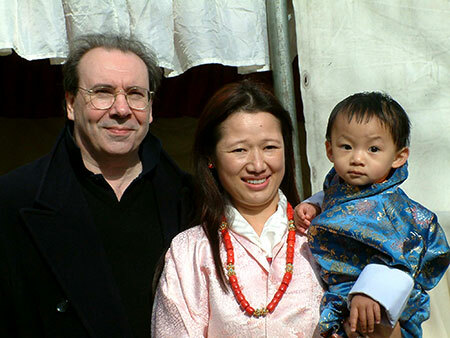 Graham Coleman with his wife Dechen and son Rinchen. Harewood 2005. Born in Richmond, England, in 1951 and raised in Luxor, Upper Egypt, where his father was the Head Artist with the University of Chicago's Egyptological expedition. Educated at Mill Hill School and the University of Bristol where he received an Honours Degree in Psychology and Drama. Studied Tibetan language and literature at the School of Oriental and African Studies, University of London, 1975 to 1976, and between 1976 and 1989 received teachings on Tibetan Buddhist theory and practice, privately, from HH the 14th Dalai Lama, HH Trijang Rinpoche, HH Dudjom Rinpoche, HH Dilgo Khyentse Rinpoche and HE the 6th Tharig Rinpoche. Chief Executive of the Orient Foundation for Arts and Culture (www.orient.org), 1983 to present. Directed the creation of the world's largest online multimedia archive of classical Tibetan knowledge (www.tibetan-knowledge.org), and established a network of multimedia documentation sites and libraries in the major Tibetan monasteries of India. Co-Founder, in 2000, of the Academy of Classical Arts in Chengdu, Sichuan, China, which resulted in the creation of the first online training resource for classical Tibetan artists (www.tibetan-arts.org). Between 2001 and 2004, initiated and managed a cooperation between the Orient Foundation for Arts and Culture, Microsoft Corporation and the Royal Government of Bhutan, which integrated Unicode based Tibetan script computing into the Microsoft Windows operating system and Microsoft applications. (http://news.bbc.co.uk/1/hi/technology/2164186.stm). In 2002, while working in Bhutan on the integration of Tibetan script into Windows, he met Dechen Chhoden, from Galing, in East Bhutan. They married in February, 2003 and their son Rinchen Sangay Coleman was born in December, 2003. Between 2010 and 2014 co-managed the formation of Gompa – Tibetan Monastery Services (www.gompaservices.com) in cooperation with senior Tibetan lamas and the major monasteries and nunneries of India and Nepal. Editor: 'A Handbook of Tibetan Culture', Rider 1993, the first complete translation of the 'Tibetan Book of the Dead', Penguin Classics 2005, and 'Meditations on Living, Dying and Loss', Penguin 2008 (www.orient.org/books.html).